Global warming is starting to hit hard like there’s no tomorrow, and at current rates of greenhouse gas (GHG) emissions, there may not be a tomorrow, as emissions continue setting new records year-by-year, expected to hit a 62-year record in 2019. So much for the Paris 2015 climate agreement! The most sensitive areas to global warming, (1) the Arctic (almost all of its multi-year ice, or old ice, is gone — already melted), and (2) East Antarctica, the coldest spot in the planet… strangely melting, and (3) Siberian ground that “no longer freezes in winter” are three occurrences that should keep world leaders up late into the night, blankly staring at the ceiling. In fact, over the past couple of decades global warming has groomed ultra-dangerous climate upheavals that could destroy sizeable swaths of civilization. But how soon remains an open question? Failing to recognize the several ominous threats of global warming, especially now that the ground cover protecting permafrost from thawing is not freezing in the Arctic wintertime, is comparable to applying for lifetime membership in the Flat Earth Society. After all, some things in life are so bloody obvious that denial is tantamount to imbecility or brainlessness, traits that are not DNA inclusive, rather symbolic of a deadness bordering on lunacy. If not global warming, then what’s behind Arctic ground not freezing in the dead of winter, exposing permafrost to thaw, and East Antarctica, the world’s coldest spot, starting to melt? In that regard, National Geographic ran a story a couple of months ago entitled: “Some Arctic Ground No Longer Freezing — Even in Winter” d/d August 20th, 2018. Still, smart-alecky people may query: Runaway Global Warming (RGW), so what? Answer: Check out Australia at year-end 2018 when all-time sustaining record temperatures brought destruction of biblical proportions, melted highways, thousands of bats deathly falling in city streets, massive losses of fishes, and fruit that “cooked from the inside out.” Yes, believe it or not, cooked from the inside out! But, that’s only a sampler of what’s in store with full-scale planetary RGW. It’ll take one’s breath away… literally! But the ground cover for permafrost did not freeze-up in a region of the Arctic where temperatures typically dip to –40° F, and where permafrost has always remained frozen since time immemorial. Is that how Runaway Global Warming starts? Probably! Not only that, but throughout the Arctic, change is happening lightning fast in geological terms, e.g., 300 miles north of the Arctic Circle in Norway temperatures reached 90°F this past spring. In other words, the Arctic is cookin’. Nearly a quarter of the Northern Hemisphere landmass sits on permafrost trapped in frozen soil that contains twice the amount of carbon that’s already in the atmosphere, which is a surefire deadly formula for trouble. The jury is still out on the National Geographic article. Hopefully, it is not a major trend throughout the Arctic, but ominously, it’s popping up in other Arctic permafrost regions. Vladimir Romanovsky, a permafrost expert at the University of Alaska/Fairbanks found freeze-ups of permafrost shifting from mid-January to as late as March, happening since 2014. The stakes in the Arctic are high. It’s common knowledge that if permafrost layers are consistently exposed to thawing, consequences can be hard, fast and not pleasant. Counter-intuitively, once it’s unfrozen, permafrost can potentially release GHG year-round, not only in summertime. And, that’s a huge problem without a solution, unless well beforehand Homo sapiens halts GHG emissions. No chance. 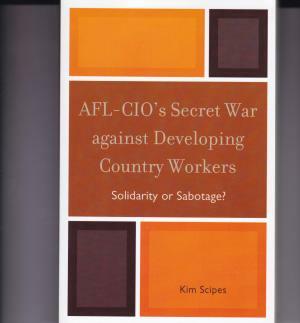 AFL-CIO's Secret War against Developing Country Workers: Solidarity or Sabotage? In-depth examination of the labor imperialist foreign policy of the AFL and then the AFL-CIO, covering from the late 1800s to 2007. Gives strong overview, and then details specific efforts in Chile in 1973, Philippines in late 1980s, and Venezuela in 2002. Also discusses NED (National Endowment for Democracy and other current operations, as well as details efforts by trade unionists to overturn these policies. Published in hardback in 2010, paperback in 2011 by Lexington Books.